Nearly a month after the LG V30 Oreo beta program went live, the final build has started rolling out. Currently users in the company's home country of South Korea are getting the update. 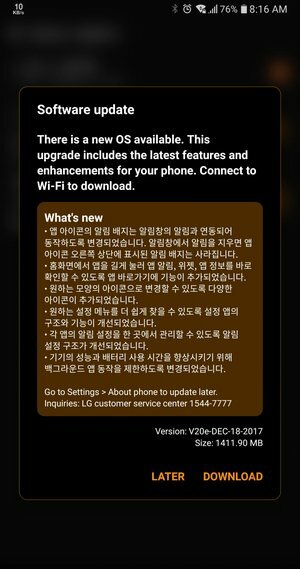 The update - which weighs in at around 1412 MB - is available both OTA as well as through the LG Bridge software, so you can also install it manually if you want. Needless to say, all the standard Oreo goodies are included in the update. In addition, LG's announcement reveals the update also brings along some LDAC-related improvements. No information on exactly when other key regions will get the update, although we expect that to happen sooner than later.